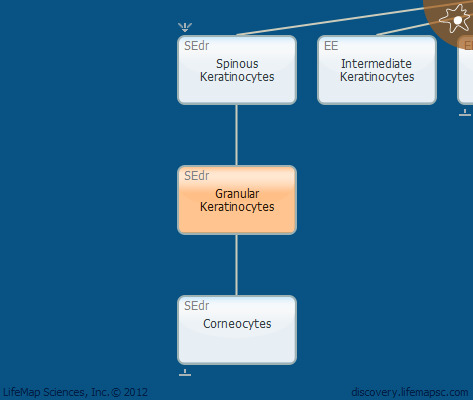 Granular keratinocytes are terminally differentiated keratinocytes, which neither proliferate nor express Krt1 and Krt10. Granular cells express Krt2 (Krt2e), loricrin, filaggrin and transglutaminase, and are also characterized by the presence of keratohyalin granules. These granules primarily contain filaggrin and regulate hydration and cross-linking of keratin filaments. At the transition to corneocytes, granular keratinocytes produce and secrete lamellar bodies, containing lipids and proteins, to the extracellular space, resulting in formation of hydrophobic cornified envelope.